My 1-year-old has started feeling a bit left out during my learning activities with my preschool age son, so this week we did a color matching activity for toddlers. She is just getting to the point where she can distinguish between colors, and it was so fun to watch her mind working as she sorted the colored sticks. The look of serious concentration on her face was pretty priceless as she took on this very important task. I giggled, but it made me realize she really loves this stuff. We’re closing in on Easter, and this seems to be one of the best times of the year to pick up bright, colorful things at the craft or dollar store. I took advantage of that for this activity, and we got all of the supplies for a grand total of $2. Not only was it inexpensive, but I get to reuse the sticks and cups for other things. The bright colored cups for this activity are actually egg dyeing cups from a dollar store set. The are perfect for filling up with fun colorful things, and then we can dye eggs in them in a few weeks. The colored popsicle sticks are also from the dollar store, and there is no end to the fun we can have with them when this activity is over. 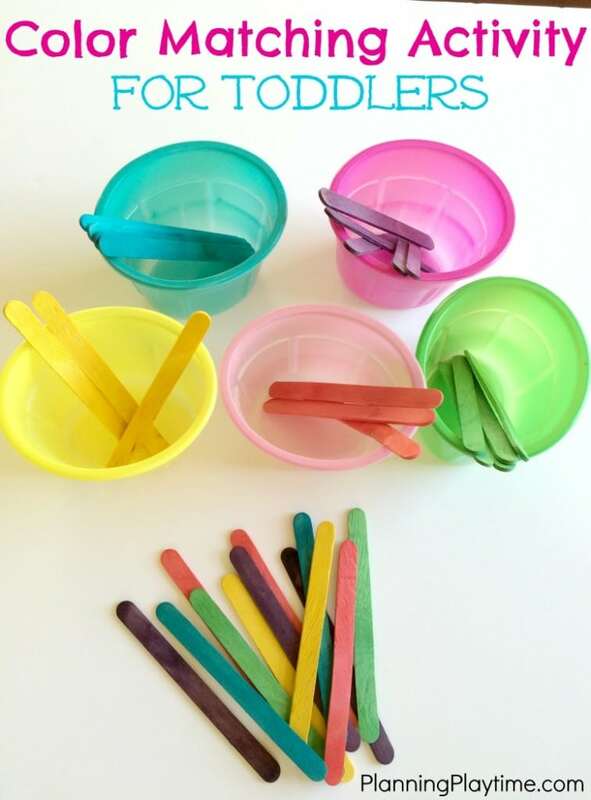 With my supplies in hand, I just found sticks that matched the colors of my cups and set them in a pile in front of my toddler. She couldn’t wait to start picking them up and placing them in the matching cups in front of her. Once she had the colors sorted, she pulled the sticks back out and kept playing with them, sorting and dumping over and over again. 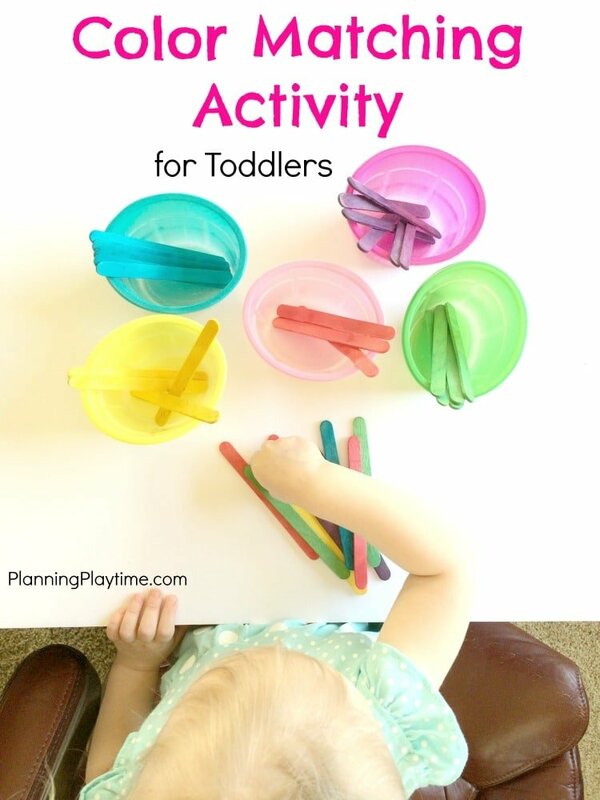 I love this activity for independent play, but it would also be an opportunity to sit next to them and say the color each time the pick up a stick. After a few times playing this way they will learn to recognize the color name in connection with the color. I hope you get a chance to try out this color matching activity for toddlers. 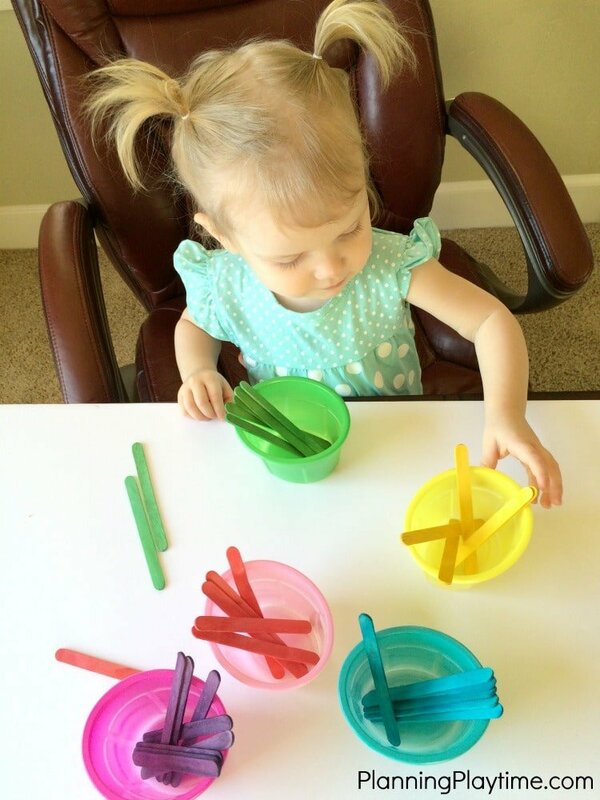 If you don’t have colored popsicle sticks you could color or paint regular popsicle sticks. Bits of colored paper could work as well, but the popsicle sticks were a lot of fun for her to grab. Whatever you use, have lot’s of colorful fun. Happy learning! What a great post and activity. Am a huge fan of the $1 store! This is such a great activity for my 2 year old- he always gets bored when I’m helping my older kids with their homework after school. It’s a simple activity to assemble, yet I know it will keep him entertained. What a great idea! Love this. My 17 month old would enjoy doing this while Miss 3 is busy.